The changes in climate led to the increased importance of environmental monitoring. In order to determine the quality of the environment, continuous tracking of the environmental parameter is needed. As the IoT and Voice Interface are the most emerging technology, it plays an important role in collecting the information from the sensing unit. Leveraging these two rapid growing technology I made a weather station and environmental monitoring device and you can be informed about any parameter like temperature, humidity, air quality, air pressure and light intensity by asking Alexa at any time. You can also monitor the parameters from mobile apps as well as web dashboard. NXP Rapid IoT Prototyping Kit provides all the necessary environmental data to Alexa and Alexa speak it for you. Thanks to NXP and Hackster for providing this nice kit. Before going further watch the demo video. 1. Internal sensors of Rapid IoT Prototyping Kit sense necessary environmental parameters and the built-in microcontroller process the data. 2. The kit becomes connected to smart phone using BLE (Bluetooth Low Energy) and a dedicated mobile app receives the sensor data and uploads to the DynamoDB cloud once in a minute. The phone app also display the data to the screen. 3. A custom Alexa Skill is used to speak the information from DynamoDB according to user's voice command. A lambda function was made to provide the data to Alexa after reading from DynamoDB and the function is triggered when the Alexa Skill is launched. i. Go to https://rapid-iot-studio.nxp.com and log in using the credentials if you have an account. Otherwise create the account first. ii. From the given example open Rapid IoT Weather Station project and go to the CLOUD tab. You have nothing to do with NXP RAPID IOT and APPLICATION tab. iii. From the CLOUD tab add two AWS DynamoDB Element with every Cloud Event Element as shown in the partial image below. You can also directly import the project I attached in the Code section. iv. After adding AWS DynamoDB Element you need to configure the element with your own value. Before configuring AWS DynamoDB Element you will be required to create a DynamoDB table first from AWS Console. Before creating a DynamoDB table you need to create a new IAM Role to allow Atmosphere to communicate with your AWS DynamoDB table. Follow the AWS Integration Setup Guide https://developer.atmosphereiot.com/documents/guides/awsintegrationsetupguide.html to configure your AWS Service. Add the created role to the DynamoDB table you created for this project. v. For easily accessing the sensor parameters from DynamoDB I want to keep only the last sensor value in the table. For this reason I deleted the previous value first and then uploaded the new value to the DynamoDB table. For this reason I have connected two AWS DynamoDB Element to every Cloud Event Element. I set first DynamoDB Element to delete the previous element and second DynamoDB Element to upload the new element (new sensor value) to the table like as following image. The following figure shows the configuration of cloud element for AWS DynamoDB. You need to fill all the parameters e.g. REGION, EXTERNAL ID, ROLE ARN and TABLE NAME. You will get all the parameters at the time of configuring AWS console. Now you need to create a Lambda function. Again you need to create a role for Lambda function for giving access to the DynamoDB. Next, select Alexa Skills Kit from Add triggers option. Keep the Skill ID field disable for this moment. We will came back to here again. After creating your Lambda function should look like following. If you never create a Lambda function before take a look to https://docs.aws.amazon.com/toolkit-for-eclipse/v1/user-guide/lambda-tutorial.html and https://medium.freecodecamp.org/aws-lambda-offering-developers-ultimate-flexibility-d8939ff4220. For accessing the sensor data from Alexa you need to create a custom Alexa Skill. Go to https://developer.amazon.com/alexa-skills-kit and start with a new skill. From the JSON Editor you can directly upload the JSON file attached in code section for creating the skill or you may use GUI. If you are new in creating custom Alexa Skill you can get some idea from the following link: https://developer.amazon.com/docs/custom-skills/steps-to-build-a-custom-skill.html and https://medium.com/crowdbotics/how-to-build-a-custom-amazon-alexa-skill-step-by-step-my-favorite-chess-player-dcc0edae53fb. After creating the skill note the skill ID and paste it to the Skill ID box in the Lambda function. I hope you already created a lambda function. Go to inline code editor in Lambda and paste the python code attached in the code section named as Lambda Function. If it is OK you are ready to go. We have completed all the necessary steps required to make the project. Now we will test our system. Power up the Rapid IoT Kit. 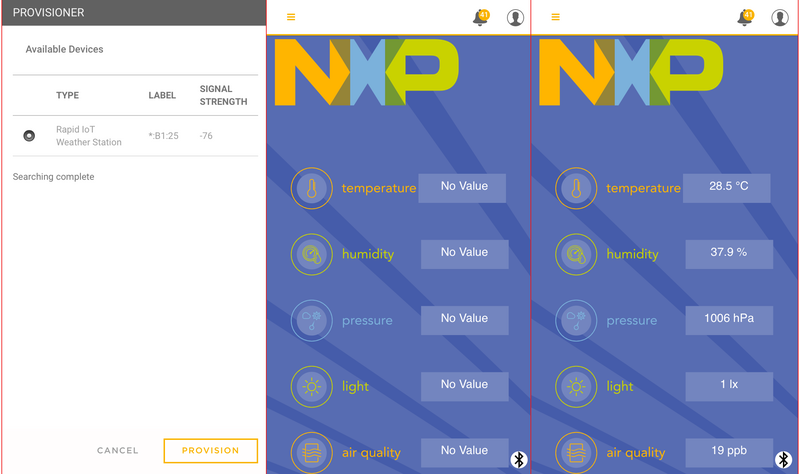 Log in to atmosphare mobile app from your mobile phone using NXP account. Search for the new devise. You should get a new device named as your project name. Select it and click to provison. After successfully connecting you will get the data to your app. If your smart phone has internet connection the data will be automatically uploaded to DynamoDB. From the DynamoDB table you can see your data. Is data is uploading successfully? Congratulation! You made it!! Ask Alexa and Enjoy!!! Return item read by primary key.
" You can ask me about any parameter." speech_output = "Yes, your room illumination is good for reading and normal office work." speech_output = "Your room illumination is more than enough." card_title = "Varifying room condition"
"What is the light intensity"
"What is the air pressure"
"What is the air quality"
"Is my room illumination is enough for reading"